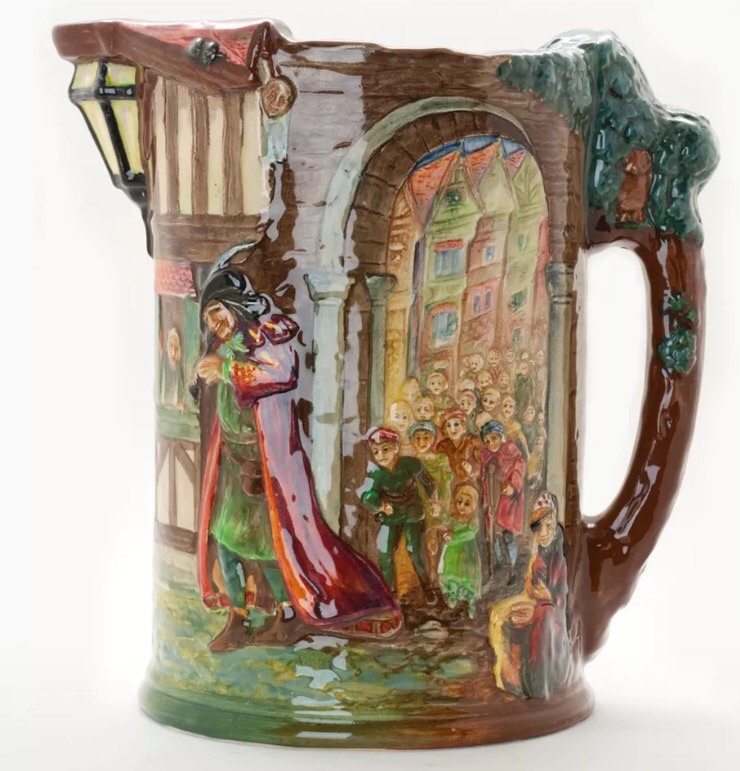 Royal Doulton Spotlight: the Limited Edition “Pied Piper Jug” (1934). We are all no doubt familiar with the story of the Pied Piper of Hamelin from our own childhoods, the hero who rid the town of its rat problem but who then turned on the town after its residents refused to pay him the agreed sum for his services. Doulton’s range of limited edition loving cups and jugs are avidly collected around the world and their enduring popularity can be attributed to the fantastic detail and riot of colour present on each of the 30 plus examples first produced in 1930. 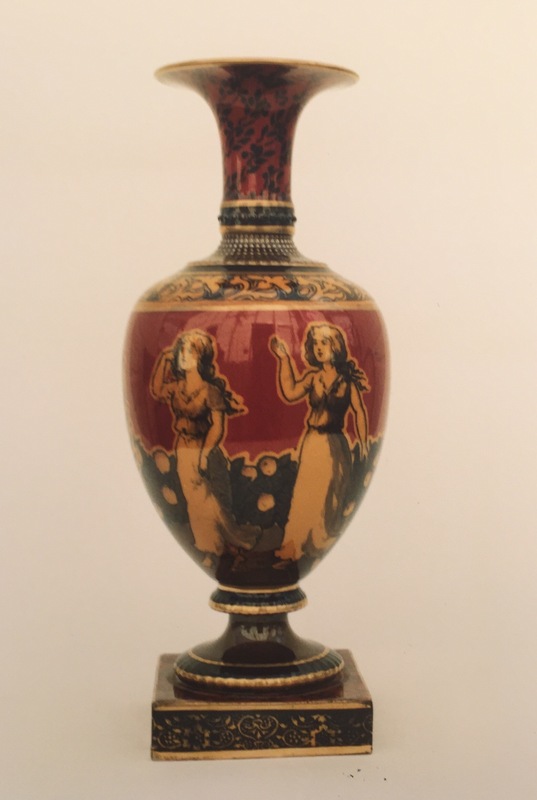 Originally the brain child of Charles Noke, he was often assisted by another of Doulton’s most skilled craftsmen, Harry Fenton and both of their signatures can be found on their work. 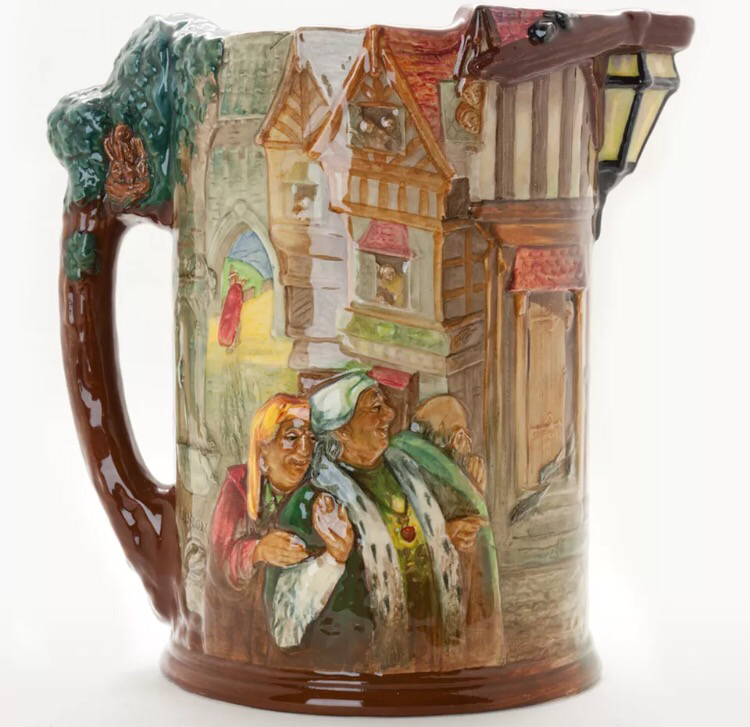 Doulton’s Pied Piper Jug was produced in a limited edition of 600 pieces in 1934 and designed by both Noke and Fenton. Measuring 10″ it depicts the two aspects of the famous take on each side: the removal of the rats watched over by the mayor and then the children leaving after the town’s refusal to pay the Piper his fee. As was typical of these limited edition pieces the base is also of great interest; here there is a version of the tale printed for collectors. Of course the story is actually based on legend although it’s precise origins are not clear. Certainly the town in Germany, Hamelin, exists and plays upon this famous legend. A stained glass window once in the town and dating to 1330 depicted the tale and it is well documented in the Luneburg manuscript (c.1440-50) where the story is recounted in detail. 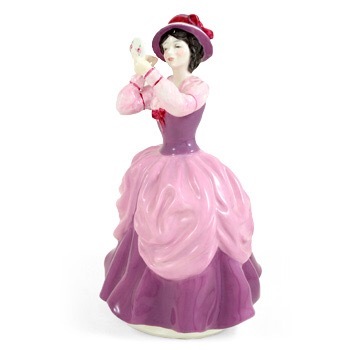 Whether you collect just these limited edition jugs or Royal Doulton generally, this piece will sit perfectly with a collection of similar jugs and there are also a plethora of other Pied Piper related Doulton items from Character Jugs to figures to collect, to make an eye-catching display! Natural Foliage or Autumn Foliage ware as it was later called, was a uniquely Doulton process whereby actual leaves were pressed into the wet clay and which were of course obliterated during the firing process, leaving the delicate outlines of the individual leaves behind. These were then hand decorated usually in shades of blue although some with blue decoration also exist. Naturally no two examples are the same. This Lambeth ware proved very popular and examples regularly turn up at auction and in antiques centres. It was introduced in 1883 and remained in production to some extent until the 1950’s with two gaps co-incising with the two world wars in the 20th Century. Named after William Morris, whose influence is immediately recognisable in the borders and of course in the backstamp often found on this ware. Close up of a Morrisian umbrella stand. With endless variations and some which do not always carry the Morrisian backstamp, it does make this type of ware an interesting field to collect as only through experience do we recognise it. Another umbrella stand, this time showing William Morris’ influence. 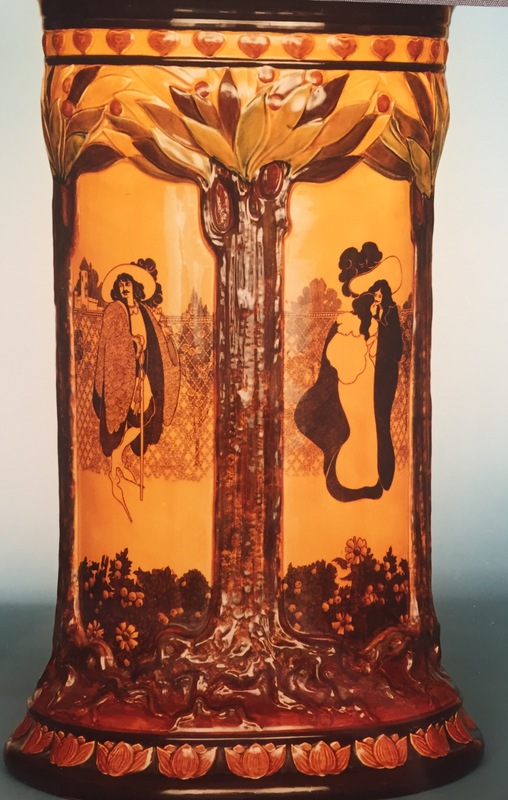 The earthenware body used is decorated in various transfer images, the most desirable of which are those of the American illustrator Will Bradley from “Beauty and the Beast”. 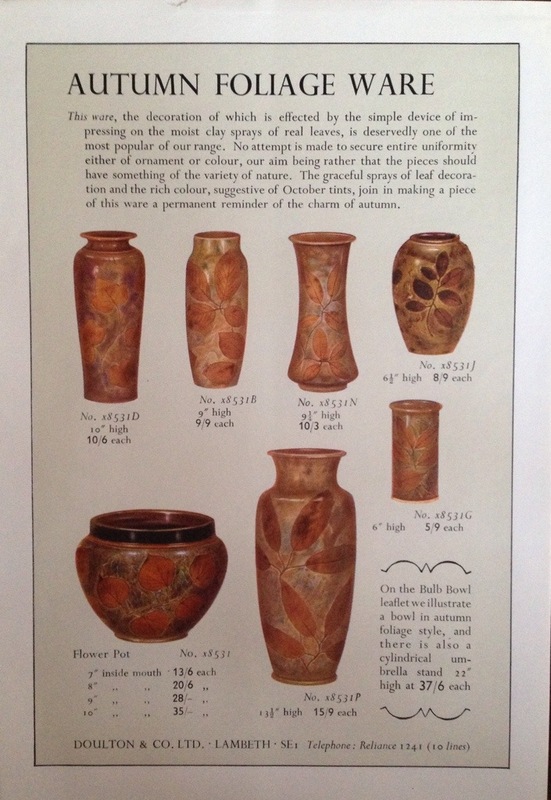 Typically pieces of Morrisian Ware are also on the larger size. A further shape of umbrella stand. The most typical scenes are those of dancing girls, young boys with garlands, Bradley’s illustrations mentioned above and a series of golfers. 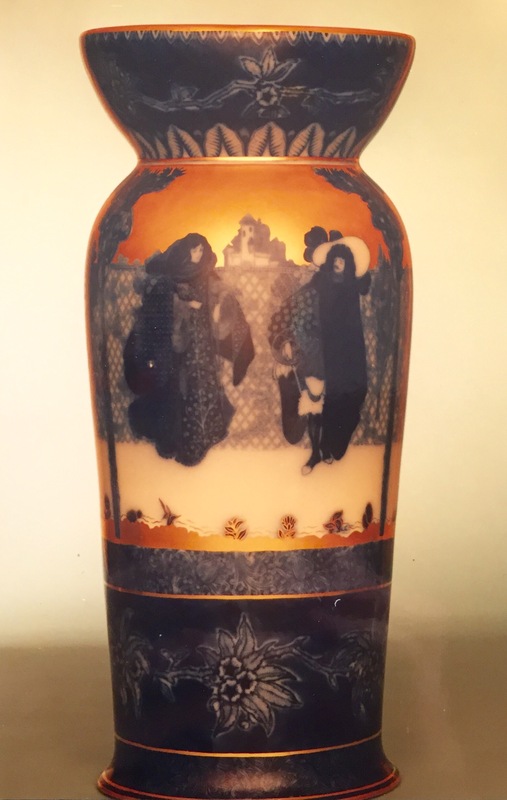 A typical pedestal vase with dancing figures. As was typical of Doulton, their in-house artists also did pastiches of Bradley’s designs of golfers and dancing maidens. 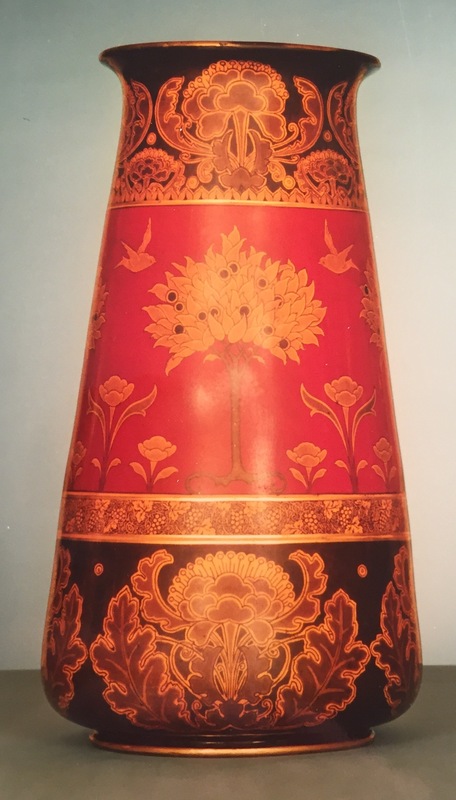 A rare blue and white umbrella stand with solid gold decoration. The three most typical colour schemes are blue and white, black and red and black on yellow. A rare blue with solid gold also turns up occasionally. 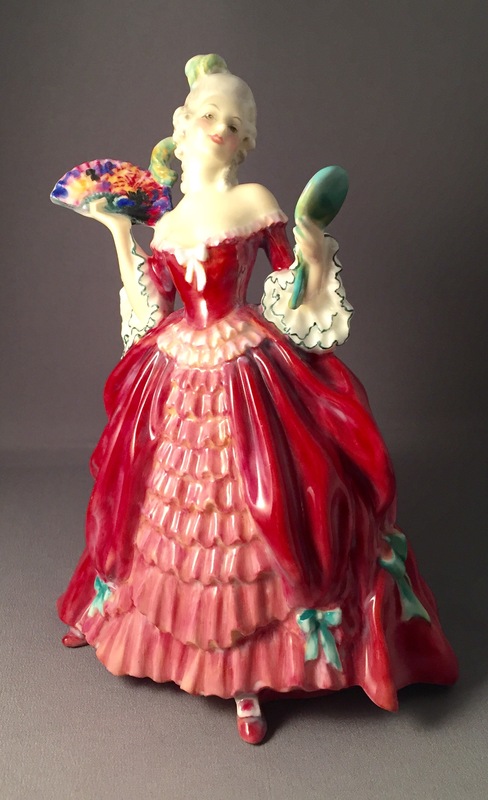 Mirror, mirror …who is the fairest Doulton lady of them all? 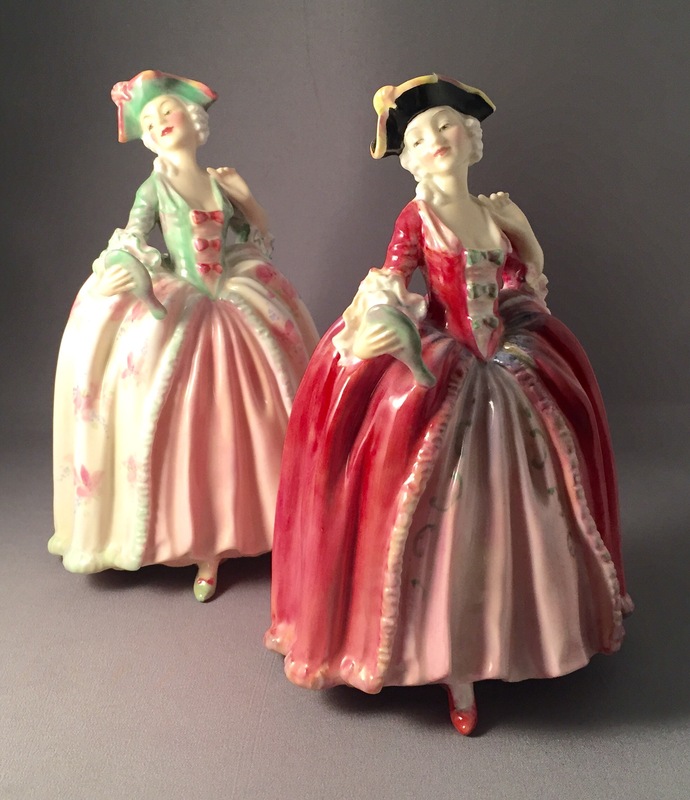 Whilst bouquets of splendid flowers, fans and ermine muffs may be what Doulton ladies are typically modelled holding, mirrors too can be found being held aloft by a small selection of figures both old and new. Camille HN 1586(L) and 1648(R). Perhaps contrary to traditional views of what is virtuous and what is not, a figure admiring her own beauty was possibly not considered a positive trait and maybe the reason why there are so few ladies holding mirrors? A prototype from 1940. Another variation of this lady has appeared holding a mask instead of the mirror. Alternatively, perhaps it is the precariousness of having an arm stretched out holding a mirror that explains why so few ladies have appeared holding mirrors. Certainly when one looks at Harradine’s the Mirror you can see how fragile that little hand help mirror is! Whatever the reason it is something of a shame as the selection shown illustrate how wonderfully stylish these ladies are. 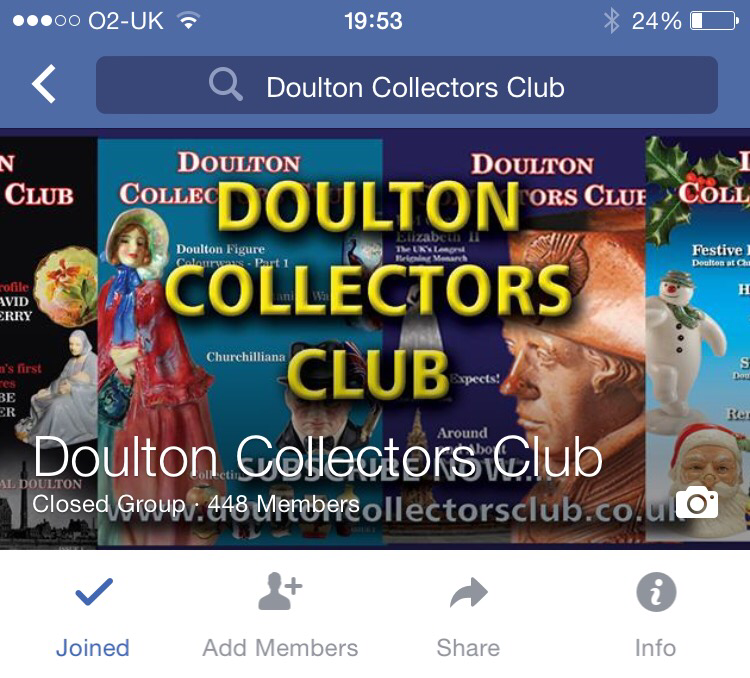 Doulton Collectors Club on facebook! Don’t forget that we have an active site on Facebook with informative articles and collectors sharing their Doulton finds and queries! Simply ask to join today! 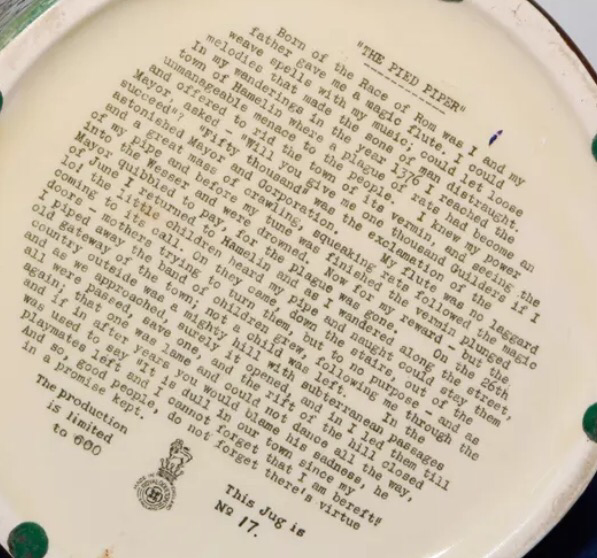 I thought you might all like to see this extra montage of the Queen’s visit to Royal Doulton at Burslem in 1949, when still Princess Elizabeth. 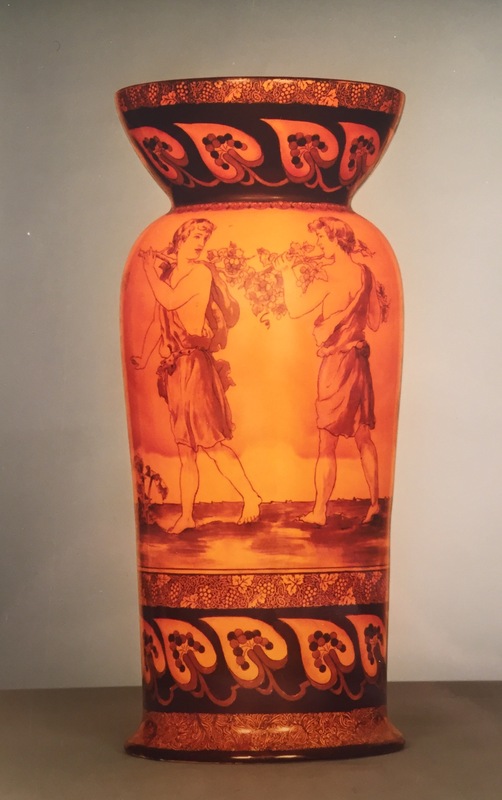 Of particular interest is some Seriesware inspired by Brangwyn ware and also the decorating of figures from this period and a comprehensive display of them! Well worth a look! 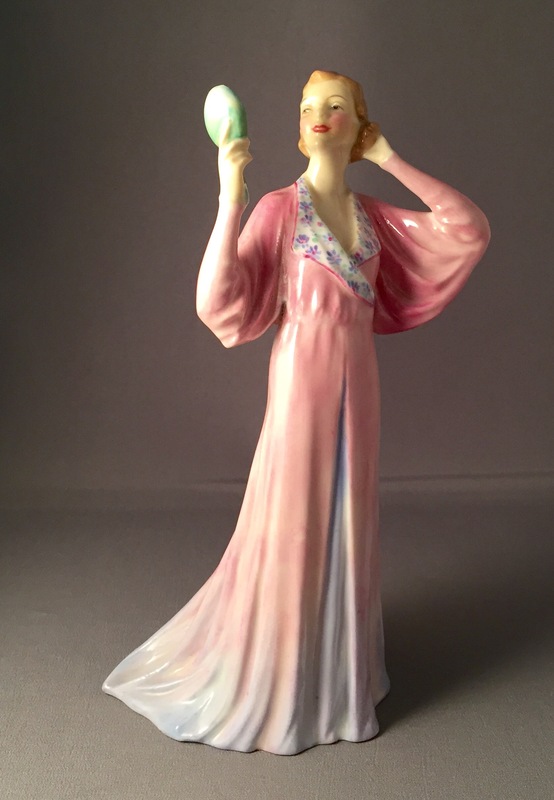 Royal Doulton’s Standing Beefeeter advertising figure. This rather quaint figure produced in the early 1920’s is another advertising figure, but this time it’s purpose is to advertise the once popular Illustrated London News magazine. It covered all topical issues and as well as political comment, satire and stories, it also included full page prints for its readers of modern pictures. It was originally a weekly broadsheet but it move to bi-annual until it ceased production after the millennium. The Beefeeter is a warder of the Tower of London and not a Yeoman of the Guard as is often stated. The Warder Beefeeter served the Towers prisioners and to protect the Crown Jewels but today they act more as tourist guides. 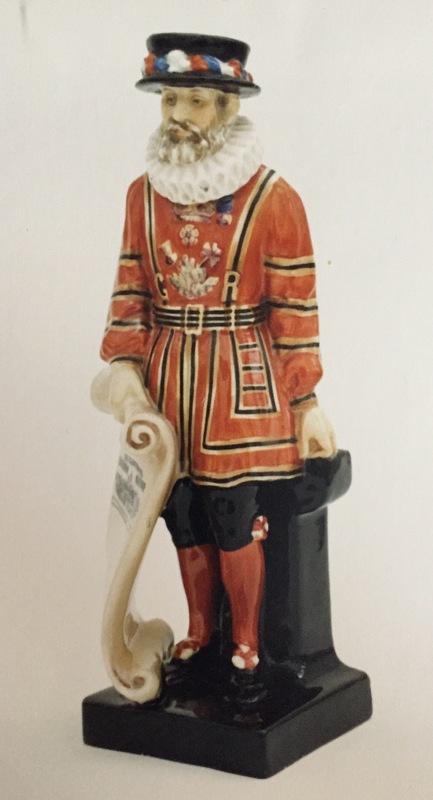 This Doulton personification of this famous London character holds an actual copy of the Illustrated London News from May 14 1842 , whose print is actually readable. Examples without any text do exist but it is the original that is most eagerly sought after.